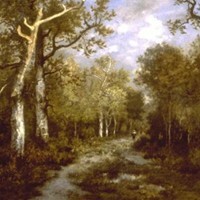 Leader of Barbizon School of Plein-Air Landscape Painting. Bordeaux Museum of Fine Arts. Great example of Barbizon naturalism. One of the best landscape artists in France during the mid-19th century, Theodore Rousseau is famous as the driving force behind the group of French painters known collectively as the Barbizon School of landscape painting, after a village by the forest of Fontainebleau, near Paris. His main contribution to modern art was his focus on naturalism and his mastery of plein air painting, an approach he acquired from studying the works of John Constable and other members of the English School. His approach to landscape painting was also influenced by 17th century Dutch Realist artists including Aelbert Cuyp. One of the great innovators in French painting, Rousseau paved the way for Impressionism, notably the outdoor approach adopted by Claude Monet (1840-1926) and Camille Pissarro (1830-1903). Born in Paris the son of a tailor, Pierre Etienne Theodore Rousseau began his artistic studies when he was fourteen, under the Classicist painter Lathiere and from 1829 onwards, under Charles Remond at the Fine Arts School in Paris. Drawn especially to landscapes, he made copies in the Louvre of works by Claude Lorrain (1600-82), the classical French master, as well as those by the Dutchmen Salomon van Ruysdael (1602-70), Aelbert Cuyp (1620-91), Jacob Van Ruisdael (1628-82) and Meindert Hobbema (1638-1709), and especially those by John Constable (1776-1837) and Richard Parkes Bonington (1802-28) of the school of English landscape painting, whose work he greatly admired. From a very early age, he painted in the open air, a rare habit among academic landscape artists but one which Rousseau mastered to great effect. He exhibited his first paintings at the 1831 Salon, and then at the 1834 Salon, when he sold one of his landscapes to the Duc d'Orleans. However, starting in 1836 and for seven consecutive years, beginning with Descente des Vaches, his compositions were rejected by the jury, made up of academic painters who did not share Rousseau's new aesthetics. (Note: He was actually nicknamed "le grand refuse", as a result of his systematic exclusion from the Paris Academy between the years of 1836 and 1841 and his own abstention between 1842 and 1849.) Collectors were no more enthusiastic. So, as his work was pleasing to neither official tastes nor to the market, Theodore Rousseau suffered from great loneliness and every type of difficulty that could torment the Romantic artist. Beginning in 1830, in order to paint landscapes, he travelled around different areas of France including Auvergne, Brittany, Normandy, and elsewhere. Among his works from those years, Valley of Saint-Vincent (1830) and Avenue of Chestnut Trees (1837) are noteworthy. However, his paintings also represented natural scenery from the area surrounding Paris, such as Plain of Monmartre (1835) and his studies of the Fontainebleau forest. Near this location was the town of Barbizon, where he settled in 1840 and founded - together with his friends Jean-Francois Millet (1814-75) and Narcisse Diaz de la Pena (1808-1876) - the artist group known as the Barbizon School of landscape painting. Other members of the group included the plein-air painters Camille Corot (1796-1875) and Charles-Francois Daubigny (1817-1878), the extreme Romantic Jules Dupre (1811-1889), the rural-child painter Joseph Harpignies (1819-1916), and the animal painters Constant Troyon (1810-1865), Charles-Emile Jacque (1813-1894) and Antoine-Louis Barye (1796-1875). The Barbizon School represented a key stage in the development of French landscape art and was an important link between Romanticism and Realism. Note: Like Impressionist painters who came after them, Barbizon plein-air painters benefited significantly from the invention in 1841 of the collapsible tin paint tube by American painter John Rand. At Barbizon Rousseau focused exclusively on landscape paintings devoid of all humans, in which woods and trees predominated, or spacious plains, depicted with a precise and objective vision of nature based on direct, open-air observation. If his painting is Realist, there is nevertheless an element of Romantic drama in it: perhaps in the gloomy and sombre tones, in the sobriety of nature and the melancholy atmosphere that characterizes his landscapes. Like all Barbizon members, Rousseau rejected the falsity of the type of landscape picture promoted by academic art, which typically served as a backdrop for a classical or philosophical message. Such works were mostly painted indoors, well away from nature, in the comfort of the studio. Instead, Rousseau painted in the countryside in order to capture the 'real' nature. Above all, he tried to depict nature's real light and colour, rather than the type of light and colour approved of by the French Academy. 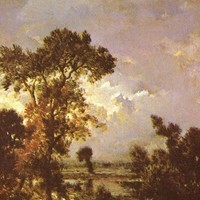 Another of his innovations was to paint the same scene during different seasons of the year or at different times of the day, an approach that was used later by Impressionist painters, particularly Claude Monet - see, for instance, his series of paintings on subjects as diverse as Haystacks, Rouen Cathedral, Gare Saint-Lazare and Water Lilies. After the Revolution of 1848, the French Academy was liberalized and Rousseau was at last recognized as a major contributor to French art. But even selling his paintings and presiding over the jury at the Universal Exposition in Paris in 1867 did not keep him away from his tranquil and artistic life in Barbizon, where he died at the age of fifty-five. His naturalistic approach was fully developed in the Impressionist landscape painting of Monet, Renoir, Pissarro and Sisley. - Forest of Fontainebleau (1867, Bordeaux Museum of Fine Arts).  For biographies of other modern French landscape artists, see: Famous Painters.  For analysis of great landscape pictures, see: Famous Paintings Analyzed.